Dr. Matthew Walton has the experience and credentials you should look for when considering a Dentures Dentist. 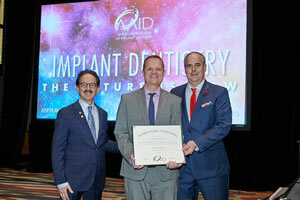 Dr. Matt Walton receiving his Associate Fellow from the American Academy of Implant Dentistry. Dr. Walton is an Associate Fellow of the American Academy of Implant Dentistry. Only 877 dentists out of all 196,000 dentists in the USA hold AAID credentials. He is also one of only a few local denture dentists who are certified to provide Intravenous Sedation to his patients. Plus he offers a wide range of denture procedures including standard upper and lower dentures, immediate full dentures, implants for dentures, implant retained dentures, All-On-4 or 6, snap in dentures, full arch implants and full mouth reconstruction. 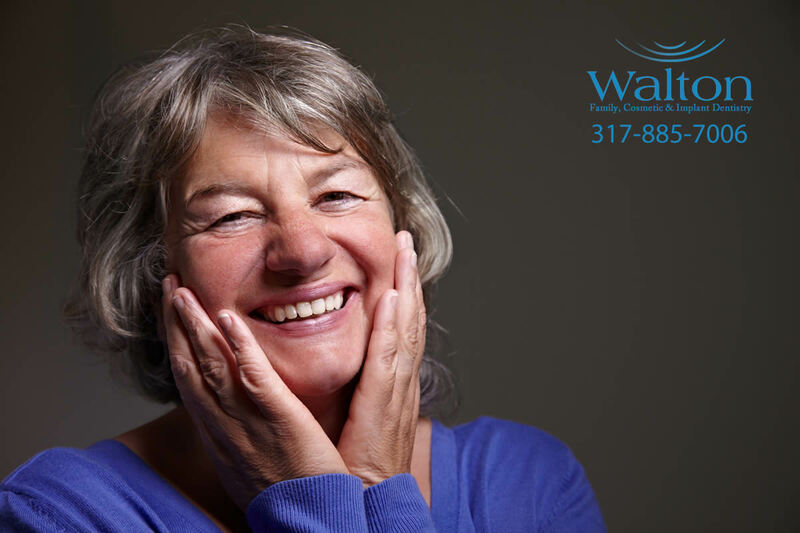 Walton Family, Cosmetic & Implant Dentistry is conveniently located just 15 minutes south of downtown Indianapolis with free parking. How much do implants for dentures cost? Find the average costs to retain your dentures with implants and costs of fixed implant supported hybrid bridges including costs of All-on-4. Do Dentures Cause Bone Loss? Will My Face Collapse With Dentures? Dr. Walton can help prevent bone loss in your face by placing dental implants for your dentures. The facial changes that naturally occur in relation to the aging process can be accelerated and potentiated by the loss of teeth. Several esthetic consequences result from the loss of jaw bone after teeth are removed. As the jaw bone resorbs, the vertical dimension between the upper and lower jaws comes closer (collapses or decreases in height). The chin rotates forward, and creates a prognathic (witches chin) appearance. The corner of the lips turn downward (reverse lip line) giving the appearance that one is unhappy. A thinning of the vermillion border of the lips results from poor lip support. Many women often then will not use lipstick at all, or will place lipstick drawn on the skin over the outside of the lips to give the appearance of fuller lips. When the dentures are inserted, they bring support to the lips, thereby masking some of these changes from the premature bone loss. 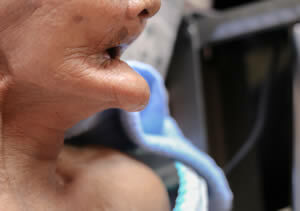 The denture gives lip support. Can You Eat Normally With Dentures? In short, soft foods are relatively easy to eat with dentures. However, the range of foods that one can eat with dentures compared with teeth is markedly decreased. The difference in chewing efficiency and bite force recorded in a person with natural teeth and the one with dentures is dramatic. In the first molar region of a person with teeth, the average biting force has been measured at 150 to 250 pounds per square inch (psi). The maximum bite force in the person with dentures is reduced to less than 50 psi. The longer the person is missing teeth, the less force they are able to generate. Patients wearing complete dentures for more than 15 years may have a maximum bite force of 5.6 psi. As a result of decreased bite force and the instability of the denture, chewing efficiency decreases with tooth loss from 90% efficiency with teeth, to 58% with dentures (decreased by 40%). In persons with dentures, 29% are able to eat only soft or mashed foods; 50% avoid many foods; and 17 % claim they eat more efficiently without the prosthesis. Can You Eat With Temporary Dentures? Soft foods are recommended while wearing the healing or temporary dentures after the teeth are removed. Typically, a knife and fork will need to be used to cut normal size food down to small bites. As the bone and gum tissue heals and hardens, foods with more substance can gradually be added to the diet. After the healing takes place, a new denture will need to be made, or the healing/temporary denture will need to be relined to make it fit better. After the teeth are removed and you are fitted with dentures, speaking will need to be re- learned and practiced. In general, at first, there is a learning curve with speaking with new dentures. However, with time and practice, speech becomes more routine and normal. This is a gradual process. How Painful Is Getting Dentures? After teeth are removed, most people are sore for one to two weeks. Pain medicine will be prescribed, but the best medicine is mother nature and a tincture of time. Swelling is normal during the first 72 hours, and then diminishes. As the gum tissue beneath the dentures heals, you may develop small ulcers or “sore spots”. These are normal, and usually can be adjusted by the dentist rather quickly. It sometimes takes 1-3 appointments to adjust the sore spots on the dentures. Typically, most patients respond fine after the teeth are removed., and the pain diminishes. The trouble that many patients have though, is getting used to the new dentures. As stated before, learning to live with your dentures takes time, and there is a definite learning curve to chewing and speaking with the new dentures. It has been said before that for every decade that you have lived in life, it will take the equivalent amount of months to get used to the dentures. In other words, if you are 60 years old, it would take you 6 months to get used to them. This is not an exact science, but gives you an idea of the transition involved with going from having teeth to having a denture. Dentures are a replacement for missing teeth that can be removed and put back into your mouth as you please. Depending on each individual patient case, they may receive full or partial dentures. Full dentures are used when all of the natural teeth are removed from the mouth and replaced with a full set of dentures. There are two types of full dentures. Conventional Full Dentures – This is when all the teeth are removed and the tissue is given time to heal before the dentures are placed. It could take a few months for the gum tissue to heal completely, and during this time you will be without teeth.